Winter is one of those seasons that makes you just want to cozy up to the fire and read a good book while sipping some hot tea. It’s not often we get to indulge ourselves in such delight though. With family in town for the season, children playing indoors and friends dropping by for a visit, finding an activity everyone can enjoy at the same time can be a real challenge. One of my personal favorite wintertime activities is storytelling. Anyone can do it and best of all, it doesn’t cost a dime. Family storytelling is fun and it has lots of benefits too, like increasing vocabulary. Picking a place for your family storytelling night should be in a relaxed atmosphere free of distractions and what better way is there than to gather around a fire. Winter is a great time to have a fire outdoors and if you have a fire pit table and chairs on the backyard patio, grab some blankets and hot chocolate for everyone and gather around the fire. Bring some marshmallows and roasting sticks for the kids too. It will help keep their interest as their attention spans aren’t all that long. There are many types of stories that work well for storytelling, such as folktales, humorous tales, traditional fairytales, trickster tales, myths, legends and heroes, or even making up your own. I like sticking with short and simple stories to keep interest. Remember that your audience ranges from young children to great grandparents so choose a story all can understand and enjoy. Children’s stories are often the best source for a variety of tales. Search your local library or on the Internet where the selection is boundless. Not everyone wants to tell a story and most won’t eagerly volunteer. That’s why I suggest a drawing. Have the kids write down numbers from one to however many family members there are on small pieces of paper. Also write down a number between one and the number of family members on a piece of paper and lay it face down. Put the rest of the numbers in a hat or bowl and have each family member draw. Once everyone has drawn, the one with the number that matches the secret number is the first storyteller. Repeat if you will have more than one story to tell. Be prepared for grunts and groans and maybe even a few laughs. We usually take turns telling stories. Sometimes the littlest ones will amaze you will their storytelling abilities! To tell a story well, the storyteller should be enthusiastic and animated. Kids are like this naturally and are eager to “show” you the story using hand gestures and funny faces. Grown-ups can learn from this technique too. Use your voice to create the mood and atmosphere as you begin the story. Since most stories begin with a conflict, use a distinct voice to show rising action and vary your pitch so you don’t sound monotone. Remember, it’s all about keeping interest, especially for the young ones. But if it’s a child who is the storyteller, let him tell the story however he wants. Adults will naturally be interested when a child is telling a story. Something I like to use when I’m telling a story is called pausing. It’s a way to make your storytelling interactive. When starting a new chapter, read the first few sentences and then pause. Ask anyone, especially children, what they think is going to happen next. Ask as many in the family as you like. The more guesses the more your story listeners will be anticipating what is going to happen. You can continue on with the story or take an idea from the guesses and make up the rest. Let everyone contribute and who knows how the story will go! 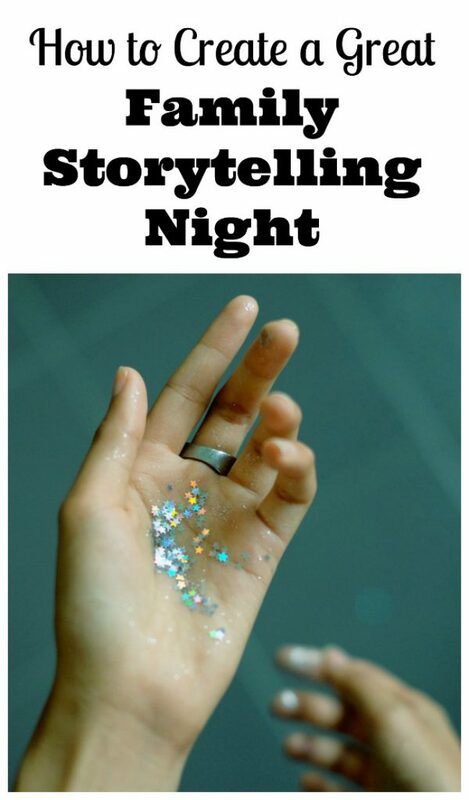 For some family storytelling nights, we even let someone else take over mid-story and see how they will finish it out. The best stories are told from those who have lived it. If grandma and grandpa are visiting, have them tell a story from their childhood. Life was so different back then compared to today. Children will be fascinated with these differences as they try and relate them to their own experiences. It’s a wonderful way to mix the generations and dad or mom may pick up some storytelling techniques they can use for bedtime tales. Some of my most wonderful memories were from my grandparents, their stories made my young imagination run wild as they took me back to another time and place. Storytelling seems to be a lost art in our modern fast-paced world but it is a powerful way to bring family together. Not only is family storytelling entertaining, but it can also be used to teach and pass on tradition to the next generation. Storytelling is a great way to pass meaningful time together as a family. I love what you are saying a lot! It’s such a nice thing when my family still has this storytelling habit. In the cold nights of winter, we gather around and my grandma starts to tell us about some fairy tales that we have never read!